I hadn’t planned to write about GEMs this time. I was all prepped to deliver y’all an epistle on the joys of using the StarBlast mini-Dob, but recent events at Celestron changed my mind. GEMs? Yeah, you know, German Equatorial Mounts. For the many amateurs who’ve grown up on SCTs and Dobs since the 1980s, the German Equatorial Mount is something of a mystery, I know. For some of us, our only exposure to these telescope mounts has been—maybe—a brief fling with the way too small GEM that came with a department store scope. After that it was one of the fork mounts sold in such great numbers by Celestron and Meade for their SCTs or a Dobsonian alt-az. Unless you decided you were an astrophotographer, that is. In that case you may have abandoned the fork. The GEM offers some substantial advantages if’n you are into the picture takin’ side of astronomical life. What is a German mount? What makes it German? Its invention is credited to one of several folks, including Joseph von Fraunhofer, all of whom were Germans. I suppose the GEM could have been called a "FEM," a Fraunhofer Equatorial Mount, but “GEM” has a nicer ring in this ol’ boy’s estimation. The question of exactly who invented it lingers, but the Ground Truth is that this mounting is such a simple machine that it could have been thunk up by anybody any time since Galileo first put eye to eyepiece back in the 17th century. This simplicity is obvious in the image (below) of Rod’s handy-dandy EQ1. It is composed of two perpendicular axes, a right ascension axis (east/west movement), which can be tilted up to point at the celestial pole and which forms a “T” with the declination axis (north/south movement). 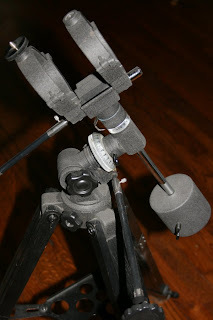 Place a scope on one end of the dec axis, put a counterweight on the other end to balance the rig, and you will find you can track the stars with single movement in right ascension rather than havin’ to resort to the up-across stair-stepping of an alt-azimuth mount. Attach a motor that will turn the RA axis once every 23 hours 56 minutes and 4 seconds to this RA axis and the GEM will automatically track the stars, making picture taking practical. The GEM ain’t the only type of mount that can be aligned on the Celestial Pole in equatorial fashion to follow the stars. Tilt a fork mount scope’s base at an angle that points the fork arms at the north celestial pole, and you accomplish the same thing. Since the 1960s, SCT-toting amateurs have been using a gadget called a “wedge” to do that very thing, to polar align their telescopes. In fact, Meade and Celestron owners, mainly those who want to take pictures with their Schmidt Cassegrains, are still doing that--though most of the fork-mount SCTs you see on an observing field today are setup in alt-azimuth mode. The computers contained in go-to forks can easily figure out how to accurately stair step their way across the sky to track stars for visual use. Normally, an alt-azimuth mount, even one driven by a computer, ain’t very good for taking pictures. The result of the stair step bidness is “field rotation.” Ever notice how ol’ Orion starts out lying on his right side when he’s on the eastern horizon, stands straight up when he’s on the Meridian, and flops over on his left side when he sets in the west? An equatorially aligned mount will automatically “follow” this changing attitude of Orion (and ever’thing in the sky), but an alt az cannot, and stars will soon “trail” in a non-equatorial image no matter how carefully it is guided. There is no doubt that hundreds of thousands of excellent astrophotos have been taken by fork-mount scopes since they went big-time in 1970. And more continue to be taken. There is also no denying, however, that many “advanced” imagers—whatever the hell that means—eschew forks even if they are shooting through SCTs. That is certainly not the case with all imagers; many prominent workers do use forks—Jason Ware comes to mind—but enough talented picture takers are employing GEMs to make it clear these mounts must have some desirable features for astrophotographers. All astrophotographers. I sure ain’t no Jason Ware. As I’ve said many a time before, I am an “Instamatic Astrophotographer,” just being satisfied with “OK” little snapshots that document my travels across the deep sky. Nevertheless, e’en I have purty much given up forks for GEMs when it comes time to shoot the sky. My imaging gear is hardly top drawer—a CG5 and an Atlas/EQ6. Yet, I prefer these bargain basement mounts over my hefty Ultima 8 fork or my even more sizeable NexStar 11 GPS’s double-tine mount. Why? Probably one of the main reasons I’m using German mounts these days is the ease with which they can be balanced. To balance ‘em in RA, you slide the counterweights up and down the counterweight shaft. Declination? Merely move the scope back and forth in its cradle. In contrast, balancing a fork mount Schmidt CAT usually requires not just the addition to the OTA of a weight and a dovetail for it to slide in, but usually also a number of Rube Goldbergish fishin’ sinker type weights and Velcro all over the tube and fork. Even then it ain’t uncommon for it to be very difficult to balance some scopes in both declination and RA. Why is balance important enough to make this a major plus for German mounts? If, like me, you can’t afford or don’t want to afford the biggest and most expensive mounting, having the scope properly balanced (usually slightly east-heavy) goes a long way toward improving tracking. What else? I also find GEMs easier to polar align in a hurry. Most GEMs either include or offer as an option a "polar borescope." Place Polaris in the proper spot on this little refractor’s reticle (usually the polar scope is installed in the mount’s hollow RA axis), and it is then sufficiently aligned for many—if not most—tasks. In the past, some fork-mount SCTs have featured finderscopes with polar alignment reticles, but in my experience, for a variety of reasons, these don’t often yield alignments as good as those done with a GEM’s borescope. Finally, one of the greatest things about a GEM is that it does not limit you to a single OTA. Celestron’s NexStar SE series fork scopes do allow the tube to be easily removed and replaced with another OTA via a dovetail arrangement, but this is the exception, especially amongst go-to forkers. In contrast, almost all GEMs attach OTA to mount via one of two “standard” and common dovetail systems: Vixen or Losmandy. Want to image M33 tonight? Slap the 80mm ED on the puppy. NGC 7331 tomorrow? On goes a C8. The ability to change OTAs easily and quickly means it’s easier to justify the cost of even a top-of-the-line mount like an AstroPhysics or a Takahashi. If one mount will serve for all your scopes, it’s not quite as painful to pay the big bucks required for a Real Goodun (well, maybe for you, anyway, but not for your Old Uncle, who is, yes, a frugal sort). As I’ve documented in this here blog in the not too distant past, my conversion to GEMs after not having used ‘em much in 30 years was brought on by my desire to add go-to to my Ultima C8. Yeah, I could just have got me a set o’ digital setting circles, sure, but after getting spoiled by the comfortable alt-az setup of the NexStar 11 I was looking to be shed of wedge-mounted forks altogether. As an experiment, I purchased Celestron’s inexpensive computerized CG5, a Vixen “clone” equipped with a NexStar hand controller. I was blown away by the accuracy of the little mount’s go-to and by the overall quality of the CG5 considering its relatively modest price. Purt soon I was even taking astrophotos again, and it just seemed easier with the GEM. From there, my love affair with the German mount blossomed, and Chaos Manor South’s dining room was soon inhabited by an Orion/Synta Atlas (Miss Dorothy is awful understanding, and storing the mount in the dining room means I don’t have to lug the 40 pound EQ head up and down the stairs). I am so et up with GEMs now that I’m considering something even bigger and heavier than the Atlas. So what’s a good GEM, then? What should the prospective buyer look for? What does a CAT owner need? An astrophotographer? A GEM buyer’s guide, even an abbreviated one, is a subject for a whole blog entry, and that will come, Kats ‘n Kittens, that will come. Before signing off, this week, though, I do want to update y’all about recent events at everybody’s favorite li’l ol’ scope company from Torrance (well sorta these days), Celestron. They seem to have gone slap GEM crazy, currently bein’ in the process of releasing not one but two new mounts. What’s especially good? They are definitely priced to appeal to the cheapskates among us—like moi. They are not in the AP – MI – Tak league, maybe, but I believe both will be fine performers for somewhat-less-than-deadly-serious imagers like Unk. Seeing as how Celestron is owned by Taiwan’s Synta, I kept wondering when a “Celestron version” of the company’s venerable EQ6/Atlas might come along. After all, Much of what Celestron sells these days is rebadged Synta gear rather than stuff thunk up in Cally-for-nye-a. The CG5, for example, is nearly identical to the go-to GEMs Synta sells under its Skywatcher, Orion, and other badges. But why would I be so interested in them releasing an EQ6 that says “Celestron” on it? One word: hand controller. Well, actually that is two words, but you get the idea where my interest lay. Despite being pleased with my Atlas, I still wished for a better hand control. The SynScan controller used on the EQ6 go-to models is OK. Perfectly workable. But it is just not anywhere near the NexStar rig in terms of features and capabilities. Not only does the NexStar controller sport things like a built-in and accurate polar alignment routine that the SynScan HC lacks; in my experience it’s easier to get accurate go-tos with the NexStar hand controller. Just align on the stars it offers and you are good to go. In contrast, using the Atlas/EQ6 SynScan computer means being careful about which stars you align on. Just because the HC offers a particular star first, that does not mean it’s the best choice or that you should accept it. Getting accurate go-tos with SynScan depends on you, not the computer, picking three stars that are well-spaced and properly positioned and sufficiently high off’n the horizon. A NexStar computer would be a great partner for the EQ6, but I knew Celestron couldn’t just throw a NexStar HC in the box with the Atlas and be done with it. The SynScan system uses stepper motors while the NexStar system uses servos (which some folks believe are “better”—maybe smoother). Obviously, a fair amount of redesigning would be required to convert the Atlas to the NexStar computer system. And I wasn’t sure Celestron/Synta would be interested in doing that. They seemed to be having a pretty easy time selling all the Atlas/EQ6es they could produce. Luckily I was wrong. When Celestron published the details of what they were calling their “CGEM” (“CGE Medium,” I reckon, or maybe just “Celestron GEM”), it was both what I expected and a considerable amount more. In addition to replacing the Atlas’ hand controller and motors with a NexStar HC and a pair of servos, they did two other important things Atlas owners have asked for for a long time (and have been doin’ themselves with the aid of 3rd party add-ons); they replaced the Vixen dovetail saddle with a Losmandy “D” compatible one and lengthened and strengthened the counterweight shaft. The Vixen saddle has been quite an irritant for those folks who’ve wanted to push the EQ6 to the limits of its payload capacity. While the GEM head itself is quite hefty, and the tripod pretty much sufficient, the small Vixen dovetail proved to be a weak point. The noticeably larger Losmandy bracket provides a considerably more stable way to attach OTA to GEM. The counterweight bar was the other sore spot. Not only was it not really long enough to permit OTAs at the top of the mount’s weight capacity to balance without nearly filling the thing with Synta’s ubiquitous 11-pound pancake weights, it was too skinny for comfort. The Atlas counterweight bar is actually smaller in diameter than the one on the dadblamed CG5 in order to allow the Atlas’ bar to be retracted into the mount. Nice feature, but most of us would have preferred more strength. The CGEM goes at least a little ways to correcting counterweight shaft deficiencies. There’s even more—surprisingly, considering the fact that the CGEM sells for slightly less than the Atlas. Another embarrassment for the EQ6 is the skinny bolts that are used to adjust it in altitude and azimuth. Oh, they work, but, being the same size as those on the CG5, they are rather difficult to turn when even a C8 is mounted on this heavy EQ head—some folks have actually bent the altitude bolt while trying to turn it. On the CGEM, the adjusters have been strengthened and repositioned. Still more? I love the NexStar software as furnished with the CGE and CG5, but Celestron has refined it even further for the new mount, if in a smallish way. I had thought (and hoped) we might see SkyAlign for equatorial mounts implemented in the new build, but nope. The only real change is the All Star computerized polar alignment procedure. This allows any star to be used for polar alignment instead of just Polaris (as with the CGE and CG5). Otherwise, it works the same as before: the scope slews to where it thinks a star should be given a perfect polar alignment, and the user then centers that star in the scope using the altitude and aziumuth adjusters to complete the alignment. In addition to its ability to use any star, the new routine is also reputedly more accurate than before. 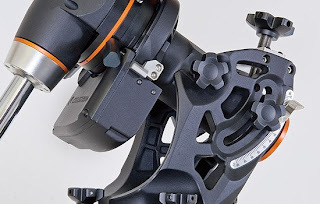 Finally, Celestron has modernized the look of the mount, although some folks find the addition of mucho orange plastic makes the “new EQ6” look gaudy rather than futuristic. Would I buy one? If I didn’t already own an Atlas, yeppers, no doubt about it. But I do own an Atlas. That doesn’t mean I don’t think the CGEM is a great mount that will be very popular and useful and make lotsa little ridge-runners awful happy. It’s just that the Atlas/EQ6 was already a great mount beloved by many folks. The CGEM is an improvement, but an incremental one. Also, the Atlas is now so ubiquitous that just about every aftermarket add-on imaginable is already available for it, including replacement Losmandy format dovetail cradles and upgraded counterweight shafts. The software? I love the NexStar hand controller and NexRemote, but EQMOD for the Atlas (it won’t work on the CGEM, by the way) is fully their equal or even their better in my opinion. I don’t claim to be psychic. But the udder day, I was talking to Good Ol’ Boy Pat and mentioned that I’d noticed Celestron had been underplaying their venerable G11-like mount, the CGE, in their advertising of late. “You know, Patrick,” says I, “I’ll bet them suckers are gonna replace the CGE with something cheaper to build, maybe something made in China. Maybe even something with more payload capacity. Like an…uh… 'EQ7. '” ‘Twarn’t a month later that we started hearing about something a lot like my prophesied EQ7, the CGE Pro. Howsomeever, not only do I not claim to be psychic, it ain’t even clear I was entirely correct. It ain’t for sure yet that Celestron will indeed discontinue the much-loved CGE, though I wouldn’t be surprised. Or that the Pro is made in China, though I assume so. What is clear is that they are kickin’ it up a notch gem-wise in a couple of ways. Yay-ah, the CGE Pro is something new alright, and not just because it’s the company’s first monster GEM (if you discount the prototype and even bigger original “CGE Pro” Celestron planned for the huge Dall-Kirkham now being sold by Planewave). What’s really special about the CGE Pro is that it’s in a heretofore neglected price class. Until now, the BIGDOG bunch started at 7 grand with Losmandy’s Titan and climbed into five-figure-land with the APs and the Bisque and Meade’s Max (assuming that is still around). There has been quite a gap between the CGE – G11 class at 3k and these heavyweights. But what about those of us who want a mount really sufficient for a C14 or an M14 (which I don’t consider the CGE/G11 to be, not for imaging)? Those of us who don’t fancy doin’ our own Hubble Deep Field exposures, and who, above all, don’t have the deep pockets required for a mount that can do that? Somebody finally listened. The CGE Pro is one big mutha. It weighs in at 154-pounds and can heft 90 pounds of payload. While it probably won’t impress the Paramount owners with its PE spec of 9-arc seconds, the rest of us will be pretty doggoned happy. Frankly, it’s likely autoguiding or even just a good PEMPro run will make this mount every bit a competitor with AP and Bisque when it comes to the raw ability to take good pictures. One other lovely thing? This is a big mount, yeah, but it is not too big. 154-pounds is enough to make this broken down ol’ hillbilly squeal, but the mount can be disassembled into semi-manageable components the younger and more fit amongst y’all need not fear. It gets even better. The Pro uses the tried and true NexStar HC, and can operate with the time-tested (and wonderful) NexRemote as well. But if you’re like Unk, what’s the main thing you want to hear? The fare. The Bottom Line. The damage. While not exactly inconsequential, the $4999.00 price of the CGE Pro is for me at least imaginable as a dream rig. There is more that I could say about the Pro, I reckon, but I’d just be quoting Celestron’s advertising copy. I’m a-gonna wait until I (or somebody I know, leastways) gets their hands on the mount. As y’all know, I am not usually one to play the all-too-typical Internet astronomy forum game of either praising to the high heavens or condemning to perdition a piece of gear that nobody but beta testers has seen except as a picture on a gull-derned website. If I wouldn’t likely trade my Atlas for a CGEM, could I be tempted by a CGE Pro? Perhaps. Assuming it lives up to its advertising hype, this is a mount I would consider. Not for portable use, though. Not even to lug to star parties a couple of times a year. That’s just me, y’all understand. Hell, I have a hard time convincing myself to drag the Atlas out when I think the CG5 will do. I would and will think about this as the foundation of a home observatory for my retirement years—if I ever get there—when Miss D. and I have said goodbye to Chaos Manor South and repaired to the sticks. I’ve often thought about a big GEM in this role, an AstroPhysics or a Paramount maybe, but, money aside (HA! ), I have never, ever been able to convince myself I really need such a thing given my decidedly lacking talents as an imager and my modest goals in that regard. What is this best thing about this GEM trend at Celestron, though, whether I ever get my hands on either of their new mounts myself? We have more choices. Kudos to the Orange Boys and Girls for that. Meade? Hey, if y’all make it over the current rough patch, at least think about doing up a MiniMax GEM, OK? I've got to say, your attempt at colloquial speech fails. Badly. Not only does it make it obvious you've no idea how to speak in an - as you say - hillbilly way, it makes your prose so difficult to read, it just isn't worth it. It ruins what would perhaps otherwise be a great read. For the sake of trying to be cute. looks like some idiot had a bad day at the office and decided to take it our on you. If commenting on your post stopped them from feeling the need to beat the kids then you provided a great service. Personally,I think you provide a great service both here and on the multiple astro fora you contribute to.